Reverend Abraham Lincoln8 Norfleet (John Watson7, Reverend Abraham6, James5, John4, John3, John2, Thomas1 Northfleete) was born 14 July 1867 in Moniteau County MO, and died 11 April 1956 in Santa Clara County CA. He married Louella Belle Mayfield 28 June 1894 in Laclede County MO, daughter of William Mayfield and Sarah Davis. She was born 08 February 1871 in Laclede County MO, and died 19 October 1909 in Edgar County IL. Abraham was not especially fond of his first name "Abraham" which was somewhat of an anachronism by the late 19th century. He was usually known by his initials as A. L. Norfleet, or just Al Norfleet. The name notwithstanding, Al Norfleet early on felt a calling to become a minister of the Gospel. In this choice he was following in the footsteps of his paternal grandfather and namesake, Abraham Norfleet (1802-1870) of Cole County, Missouri. 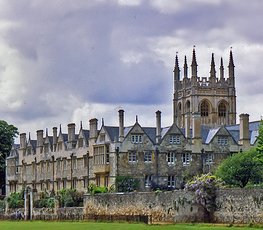 To prepare himself for the ministry, Al Norfleet attended the University of Missouri at Columbia for several years and then transferred to Northwestern University in Evanston, Illinois (near Chicago), where he received a Doctor of Divinity degree in 1898. Shown on the right is a copy of a latter written by Abraham Norfleet to his father (John W. Norfleet) and brother (Arthur Norfleet). At the time, Abraham was in college at the University of Missouri and, as is typical of all college students, he asks his father for money! I suppose Viola has written all the news. I am so busy I have hardly time to write to anyone. Bookkeeping and Chemical Laboratory take most all of my time. Examinations & close of school are creating stir and rustle. We have had no time for anything but study. Our male quartette is progressing. Well I will need that twenty dollars by the time you can get it here. It takes so many books & I have no summer clothes. I will need about fifty dollars in all before I can make any more - now send some soon. I will have to work hard all day tomorrow. Must now go to bed. Good night. In 1894, four years before he received his university degree, Al Norfleet married Louella Belle Mayfield, the daughter of a prosperous Laclede County, Missouri farmer. In 1898, Al got his Divinity degree and he and his wife began the arduous and difficult career of propagating the Gospel as a minister of the Methodist Episcopal Church. For the next eleven years Al and his wife Louella moved frequently as the needs of the church so dictated. During this period most of his pastorates were in the Midwest. 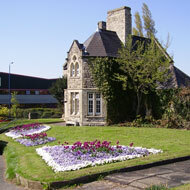 They had three children: Evalyn, born in 1895; Robert, born in 1898; and Clark, born in 1906. Unfortunately, while living in Edgar, Illinois, Al's wife died prematurely of a heart attack in 1909. A few months previously, Louella had returned from an extended and arduous visit to Lebanon, Missouri to nurse her sick mother. Her mother, Sarah Amanda David Mayfield, died on 13 March 1909. Unfortunately, Louella was to follow her mother in death just seven months later. 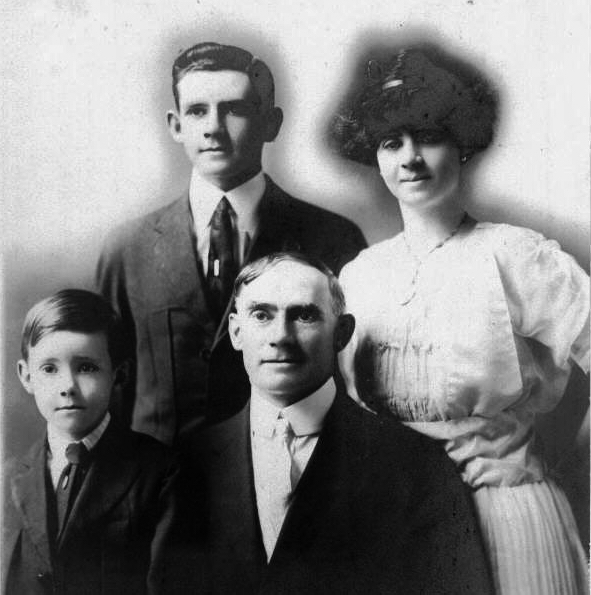 Reverend A. L. Norfleet (seated) and his three children, from left to right: Clark W., Robert L. and Evalyn S. Photo was taken in about 1915, six years after the death of Louella Norfleet. The following photograph and obituary for Louella Belle Mayfield Norfleet appeared in the Minutes of the Illinois Conference of the Methodist Episcopal Church, Eighty-Seventh Session (published 1910), at page 183. MRS. LOUELLA B. MAYFIELD NORFLEET was born in Lebanon, Mo., Feb. 8, 1871, and died in Edgar, Ill., Oct. 19, 1909. The immediate cause of her death was heart failure, after an illness of two weeks. She had for a number of months previous been greatly worn and over-burdened with the care of her aged mother in Lebanon, Mo. This service, which she cheerfully rendered, overtaxed her strength. Added to this, while her husband was in attendance at the session of the Illinois Conference in September last, Sister Norfleet was severely burned by the bursting of a jar of hot fruit, which she was sealing and the injury and fright were such that she never fully recovered from the shock. These, with a complication of physical difficulties, so weakened her condition that she passed away suddenly. 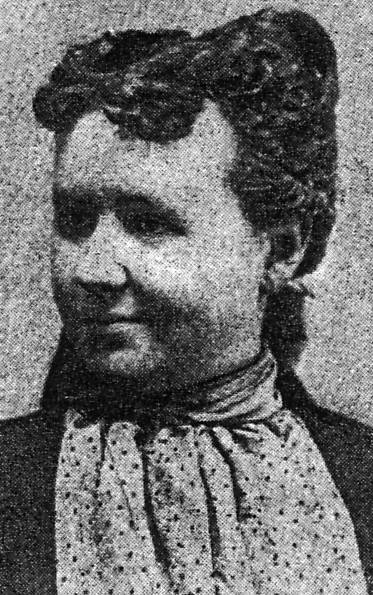 In 1894 she was married to the Rev. A. L. Norfleet, at that time a member of the St. Louis Conference. To this union were born three children, one daughter and two sons. Mrs. Norfleet was converted, and united with the Methodist Episcopal Church South, in her childhood, and became an active and earnest worker in the church. She was educated in the Woman's College at Lexington, Mo., and became a leader among the young people. She was always a ready helper to her husband and the charges where they served. She loved her home, her family and the church. To these she devoted her strength and energy, and in these her Christian character shone the brightest and best. The funeral services were conducted at Edgar, Ill., by the Rev. S. H. Whitlock, assisted by the Rev. J. E. Strevey. The body was taken to Lebanon, Mo., and deposited in the Lebanon cemetery near that of her mother, who had just gone on a little before. Shortly after his wife's death, Al Norfleet was transferred to a church in Tolono, Illinois. The following transcription, concerning Reverend Norfleet's arrival in Tolono, is taken from a newspaper clipping in my possession. The article appeared in a local Tolono, Illinois newspaper. The clipping is undated but probably was written ca. 1910. REV. A. L. NORFLEET CORDIALLY WELCOMED TO TOLONO. Large Congregations Listen to His Morning and Evening Discourses. On Sunday last the Methodist Episcopal church was well filled both at the morning and evening service, to the pastorate of this charge. After the preliminaries were concluded Mr. Norfleet made some very appropriate remarks by way of introduction of himself and family. His wife passed away about a year ago leaving a young girl, Miss Evalyn, and two small boys, Robert and Clark, for whom Mr. Norfleet requested the friendly consideration of Tolano people. He preached from First Corinthians 1-2: "And I, brethren, when I came to you came not with excellency of speech or of wisdom, declaring unto you the testimony of God. For I determined not to know anything among you save Jesus Christ and Him crucified." The sermon was both touching and inspiring. At the close of the service the congregation moved to the front and in the old fashioned Methodist way showed their willingness to become acquainted as co-laborers together. uplifting things of life was forcibly dwelt upon, as were the other points in the context. Reverend Norfleet spoke feelingly of the excellent worth of the recent pastor, Rev J. M. Judy. The two ministers have had close acquaintance during eleven years, having been classmates in Northwestern University at Evanston. Mr. Norfleet paid fitting tribute rte the splendid character and indefatigable efforts of Mr. Judy along all lines that make for righteousness. Reverend Norfleet and family come to Tolono as strangers and their recent bereavement lays a responsibility upon the members of the Methodist Church which it is their duty (and it should be their pleasure) to perform. But aside from this consideration, it is the duty of all members of a church to stand by and uphold its pastor. It is expected that members of a church will faithfully abide by the vows they made on accepting the obligations of church membership. During the remainder of his ministerial career, Reverend Norfleet was a member of several different conferences within the Methodist Episcopal Church. However, in 1917, apparently as the result of a doctrinal dispute, he withdrew from the Nebraska Annual Conference of the Methodist Episcopal Church and joined the Congregationalist Church. Thereafter he served as the pastor of several churches located in both the South and West. Most notably, he spent several years as the pastor of the New Congregational Church in Roseland, Louisiana. 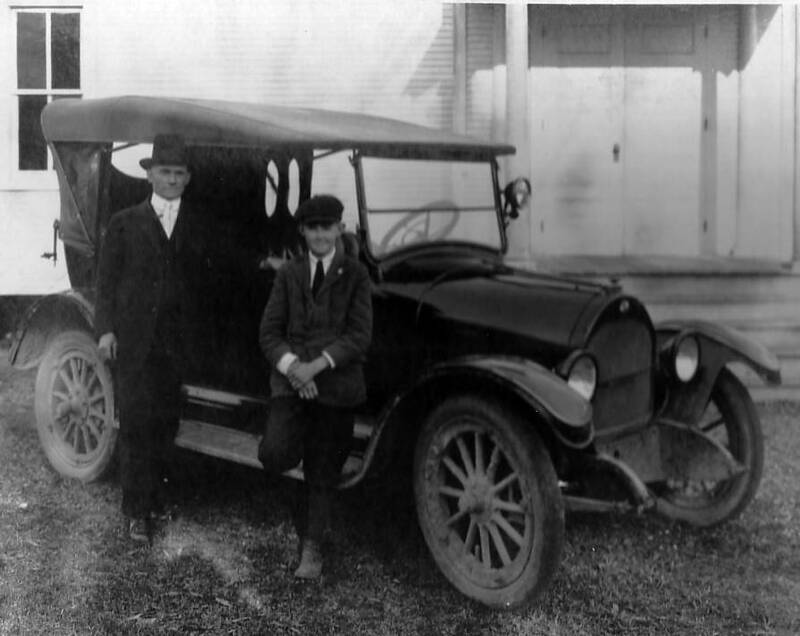 Reverend A. L. Norfleet and his 11 year old son, Clark, posing in front of their brand-new 1917 Dodge Touring car. Photo was taken in Roseland, Louisiana in October 1917. Later in life, some of Al Norfleet's callings were to churches in the West, including some in Colorado. On 30 October 1942, he celebrated 50 years in the ministry while preaching at the Congregationalist Church in Castle Rock, Colorado. A few years later Al retired from the ministry and went to live with his daughter, Evalyn, in San Jose, California. He died in San Jose on 11 April 1956. 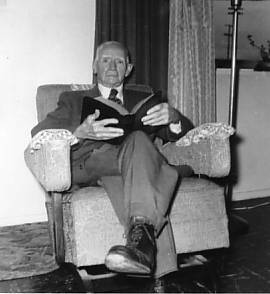 Reverend Norfleet reading his Bible at his daughter's home in San Jose, California. Photo was taken in 1955, about one year before his death. i. Clark Wesley9 Norfleet, born 12 June 1906 in Laclede County MO; died 02 May 1984 in Larimer County CO. He married Violet Dorothy Mortier 21 November 1925 in Jefferson County (Golden) CO; born 14 July 1906 in Scott County IA; died 07 July 1978 in Denver County CO.
ii. Robert Lincoln Norfleet, born 12 September 1898 in Laclede County MO; died 14 July 1993 in Arapahoe County CO. He married Lucille D. Stroud 01 June 1917 in Denver CO.
iii. Evalyn Sarah Norfleet, born 24 July 1895 in Laclede County MO; died 20 October 1984 in Santa Clara County CA. She married (1) Arthur Burton McIntosh 25 November 1914 in Ellensburg WA; born 16 February 1888 in Callaway County MO; died 15 July 1918 in France (World War I). She married (2) Sidney Willcoxen 12 November 1921 in Arapahoe County CO; born 07 April 1892 in Alto Pass IL; died 10 December 1964 in Santa Clara County CA.